here's a little tool which I have created with our ANKHOR FlowSheet. 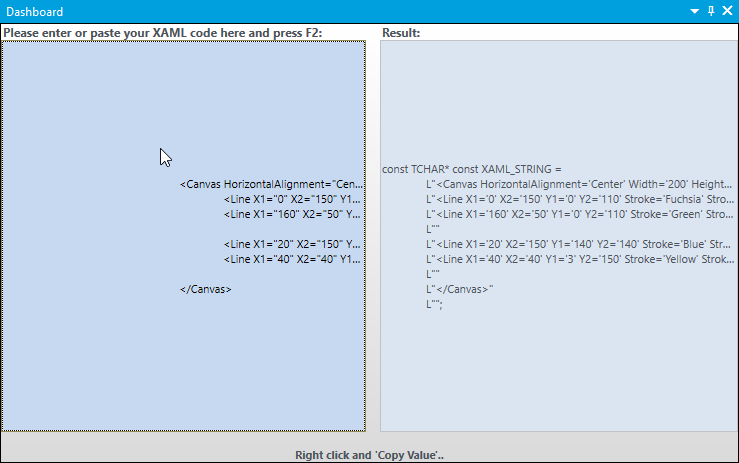 Our application is based on the XTreme Toolkit and we're also using the XAML controls everywhere. When I'm adding a new piece of XAML, I usually used the MarkupPad first to create a prototype there. Just copy and paste XAML into Visual Studio works of course, but I always have to convert it into the c++ format. This could get annoying when you have to do it over and over again.. So I created this little FlowSheet to do the conversion for me. 2. Press F2 and the converted and ready to use C++ code can be copied from the right section. So what do you need to use it ? Have fun and save time ! Great tool, Alex. Thanks for sharing that stuff!